Whip up a batch of these Easy Chicken Skewers. The delicious combination of ingredients mixed with BBQ sauce and soy sauce makes these Easy Chicken Skewers a moist and tasty treat. Mix water, barbecue sauce, peanut butter, soy sauce, cilantro and mustard in medium bowl with wire whisk. Refrigerate half of the mixture to use as a dipping sauce. Pour remaining mixture into large resealable plastic bag. Add chicken; seal bag. Shake gently to coat chicken. Refrigerate 1 to 2 hours to marinate. Preheat grill to medium-high heat. Thread chicken onto 12 skewers in ribbon fashion; discard any remaining marinade in bag. Grill 5 to 7 min. or until chicken is cooked through. Serve with the reserved dipping sauce. To easily cut chicken into strips, use a sharp knife, and cut while the chicken is partially frozen. 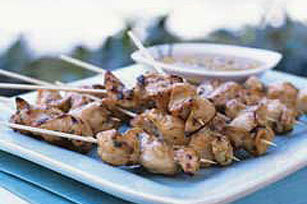 If using wooden skewers, soak in water 30 min. before using to prevent them from burning. These chicken skewers also make great appetizers. Makes 12 servings, 1 skewer each. Makes 4 servings, 3 skewers each.